Description: M-615 is an additive to low and medium pressure boilers. It will provide improved heat transfer efficiency and longer equipment life by keeping the system free from corrosion attack and harmful insulating deposits. This product contains corrosion inhibitor and anti-scalants, and can be combined with other boiler additives (oxygen scaengers, nuetralizing amines, etc.). 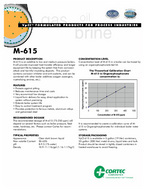 Protection:The recommended dosage of M-615 (75-250 ppm) will depend on several factors such as boiler pressure, feed water, hardness, etc. Please contact Cortec for recommendations.